It is still Christmas and Good News! Twelve Days of Christmas: My Day! Monday Finishes and Weekend Fun! I hope everyone had a wonderful Christmas and are still enjoying the spirit and love of the season. I notice a lot of people are taking down their trees and ending the holiday, but did you know that Christmas is not over? 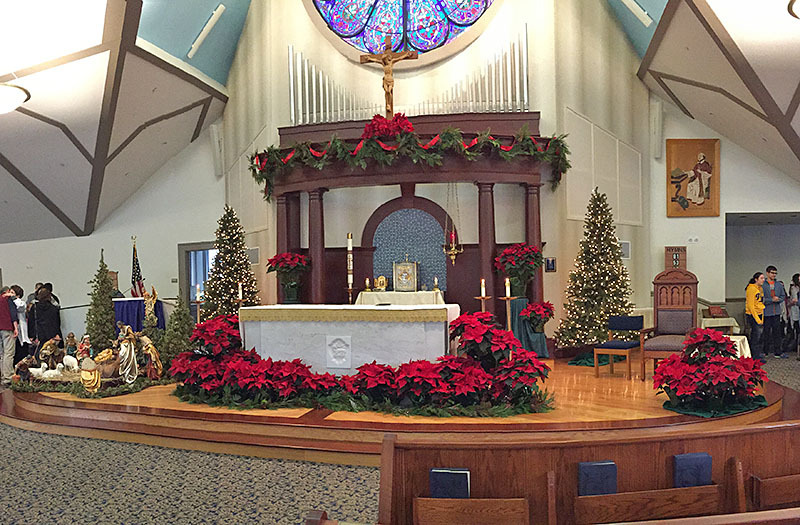 In the Catholic church, Christmas is still celebrated. From the Epiphany, when the Magi found baby Jesus to the baptism of Jesus, which closes the season. I never knew that or maybe I forgot, but I have always kept my decorations up through the month of January, so I celebrated, without even knowing it. So, if you love the warmth and feeling that your decorations bring to your home, enjoy them and keep them up for a few weeks longer. 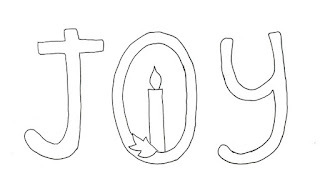 I have always felt that let down after Christmas and now I feel a renewed joy with the special masses each week. Next week we will have a special concert after mass with the children depicting the events of the nativity. Whether you are catholic, christian, or any religion or belief, why not keep the spirit of Christmas in our hearts, just a bit longer and continue to feel the joy that we get leading up to Christmas, maybe even start your own, new tradition with your family. This is our church, I love how it is decorated in natural greenery, along with the poinsettias and creche. 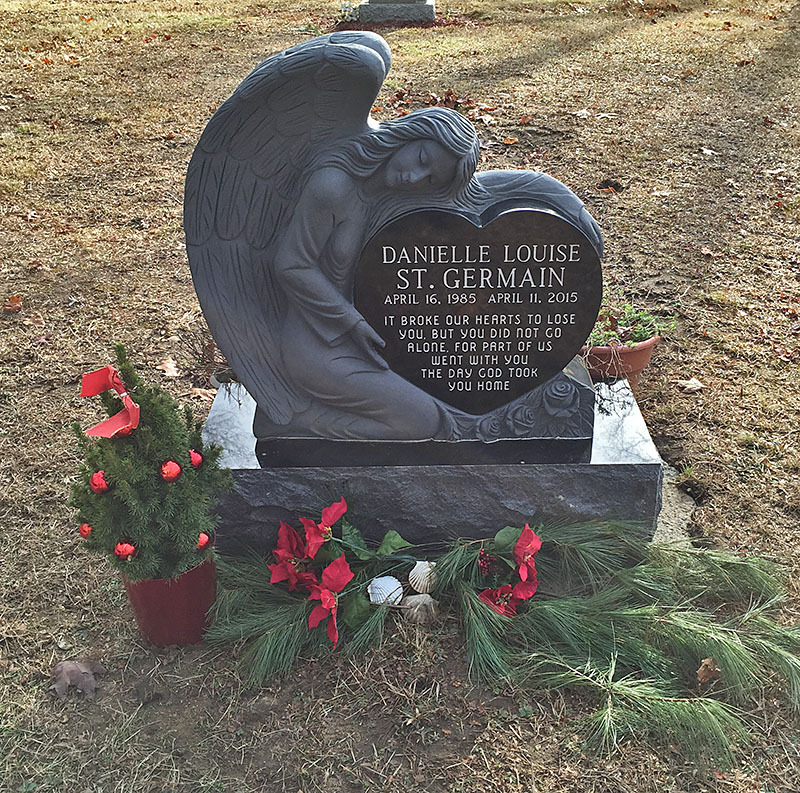 The church has been a source of strength for us since we lost Danielle and I only wished it hadn’t taken her death to lead us back. The photo is a panorama so it looks a bit distorted. 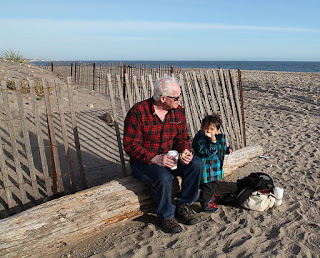 Saturday was family day, we had Nicholas for the day and since it was nice out, we took a ride to the ocean and enjoyed a picnic at the beach. 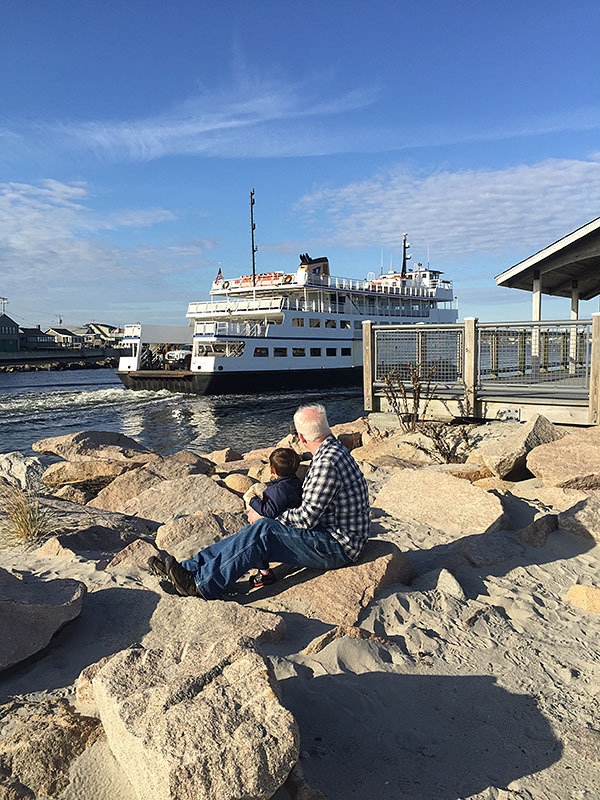 Grandpa and Nick enjoyed watching the ferry, as Nick ate his lunch. After lunch, we walked a little on the beach. It was nice and sunny, but the breeze was a bit cool. Nick loved walking in the sand and exploring the items that get washed up with the tide. I love how he starts getting more independent when we take him places. I am blessed to be able to spend time with him and share our love of nature with him. I hope everyone had a nice weekend and would love to hear what new things you will be making this year. I have new ideas and will be creating again, so who knows what I will create next. And the good news? 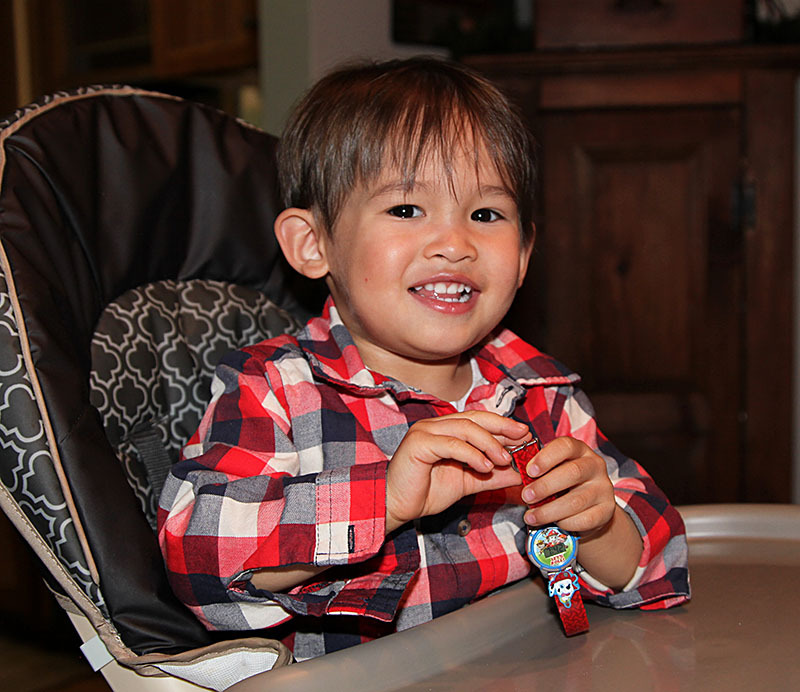 If everything goes well, Nicholas will be a big brother, so something to look forward to in May, a new addition to the family. I hope everyone had a nice day, no matter how you celebrate the holidays. One of the things I did to celebrate was to share the love and memories on a tree for Danielle, in our beach room. I think of it as her room and now it is my room, so it is our room. I found a prelit tree with pinecones, simple but nice. I made christmas cards using photos of her and her friends and family and printed them card stock. I hung those on the tree and yesterday I found two hanging signs, one says Believe and one for Joy. I turned it on, on Christmas eve and it will stay lit till midnight tonight, my gift to her this Christmas. I also wrote a little poem to her, not the best literary piece, but it came from the heart. as you celebrate Christmas in Heaven tonight. Christmas Eve was spent at our house. We made a turkey dinner and let Nick open a few presents. He loves wearing my watch, so now he has his own. Today we visited her grave. It was a nice feeling to be able to see her stone in place and I knew she is smiling down on us, when the sun broke out and the beam cast it's rays on her stone, creating a rainbow of color across the angel. The afternoon was spent with the kids, yes I still call them kids;) My son and wife made dinner and after we enjoyed present opening with Nicholas and playing with his new toys. 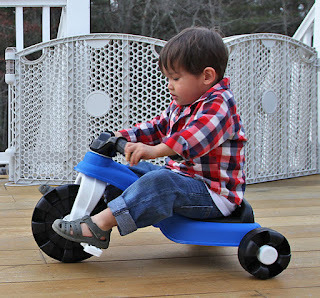 We got him a little bike so he could learn to peddle and not have to worry about falling, this was perfect for a learning bike. 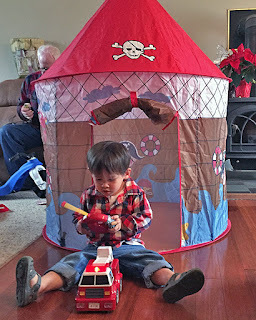 He wasn't too sure about going in his new fort, but then he drove his new firetruck into it, so he had to go in to get it. The house is nice since it pops down and fits into a small carry sack, so he can bring it to my house when he plays here. Now it is time for me to have some me time, lots of projects to finish, new ones to start and lots of ideas for new creations. This weekend Bill had to work so I used the time to get caught up on my blocks from Buttermilk Basin. One block was a pumpkin and I decided to change mine to a turkey and pumpkin for Thanksgiving. I kept the candy cane simple, but I did add some jingle bells, not sure if that is a good idea for a quilt and not sure how big the quilt will be, but I think it will be more for display than use or maybe I may end up gifting it, if I don't make a mess of it. I had fun with the mitten, added a few embellishments for fun. I am thinking about the sashings and border, maybe blue? Here are all the blocks with the layout. I think I have some out of order, but I think this looks good, do you? The blocks are a bit larger than the original, so I will be cutting them down to size. On the home front, I have been trying to get ready for Christmas, and with only two days left, I come down with a stomach flu, such is life. We are going to go with turkey again, that way Bill can do the cooking and I will do a few dishes, so I can get the house done and not over do it. 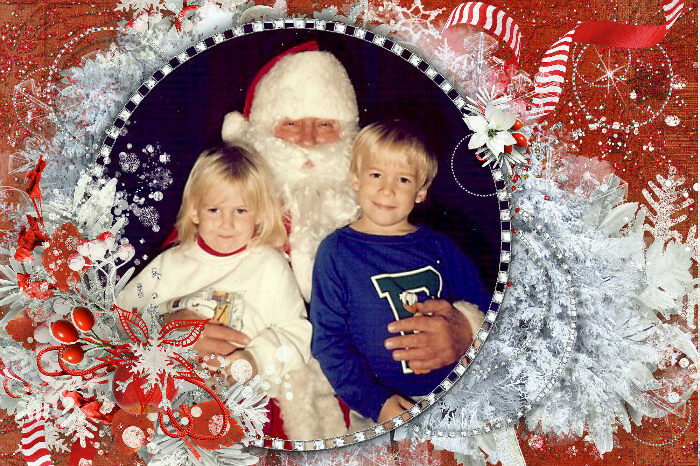 Ever since I was young, I have had a believe in Christmas wishes and miracles. Today I was granted two of my wishes, one was for a friend of my daughters who was coming home for Christmas and missed her flight, but today she made it home, so that made me happy. She was one of my daughter's best friends so it will be good to see her again. 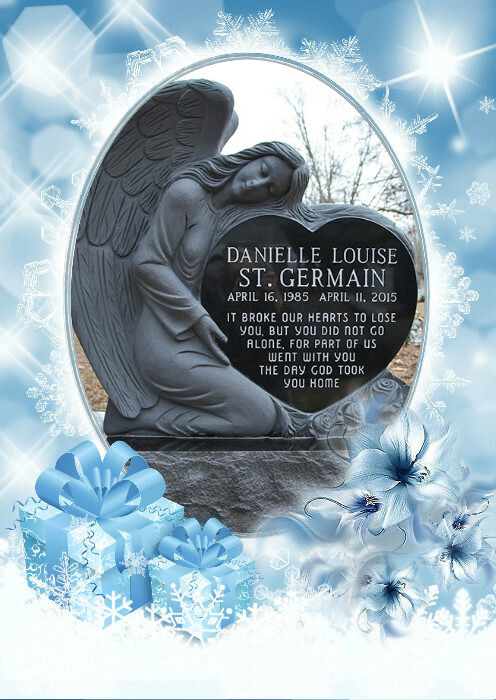 The second wish was for my daughter's gravestone to be in by Christmas. Well, two days left and no word from the company. Bill called and they said it was there and ready to go in and when we got to the cemetery, the caretaker was just pulling up to pour the foundation. He told us that it will be ready to go on, Christmas Eve. What a wonderful Christmas present for us, yes Christmas wishes do happen. I want to wish everyone A Merry Christmas and blessings to all who have followed me this past year, been there for me, during the good and bad times and lifted me up when I was low. May all your Christmas wishes come true! I have finished sending out cards and gifts and now I will try to wind down and start thinking about getting the house ready and a meal planned for Christmas dinner. We will do Christmas eve and the kids will do Christmas day. This week I made something for me. I wanted to have something to hold some balsam to hang on a rack at the top of the entrance stairs. Now my guests will be greeted with the smell of pine. I used a pattern I did in appliqué, by The Teacher's Pet, and did it in punch needle, this time. I used wool for the back and a wool cuff, then I made a pouch from scrap batting to put the balsam in. That way I can take it out after the holidays and the balsam doesn't get stuck in the mitten. 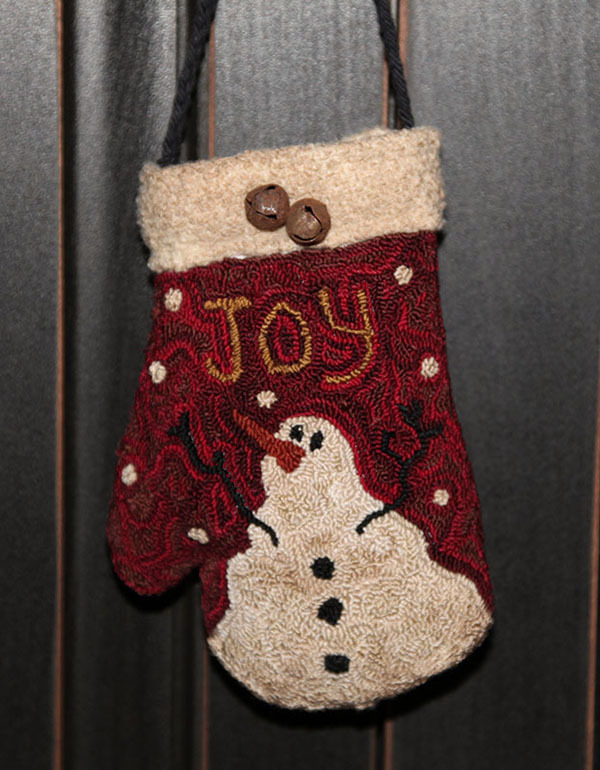 The hanger was made by braiding cotton yarn and sewing it to the inside of the stocking, then I added a few bells. Stockings and mittens are fun pieces to make and you can use any christmas design on them, we all have appliqué patterns that work as well with punch needle. 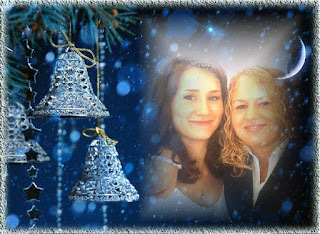 I am doing some of the old photos from past Christmases with the online cardmaker. It is a great way to decorate old photos and I try to use colors and frames that help to clean up the damage from age. One of our visits to the mall santa. I hope everyone has a wonderful weekend and are ready to relax and enjoy the holidays with family and friends. 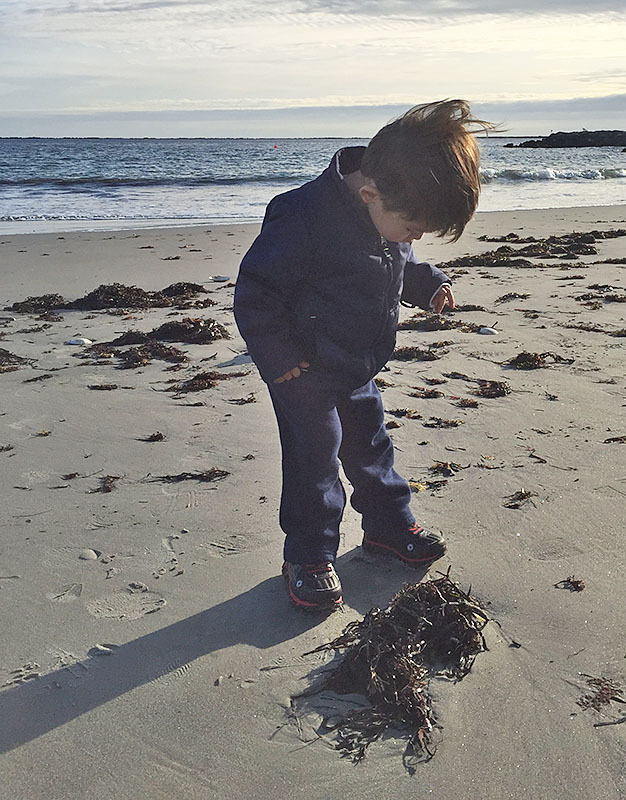 I hope everyone had a wonderful weekend, we had beautiful weather and were able to get out and enjoy some time at the ocean. I also did some finishing on pieces I made. I wanted to dress up the little pillows so I went looking for red bells and it is Christmas, so getting bells is no problem, right? Well, two stores and all the good bells were gone, no red and all I could find was the shiny ones, not what I wanted but they will have to do. I also made up some tags to put on them so people will know it is ok to take one. I plan on taking them with me when I go out and hiding them in areas where they will be found but hopefully no one sees me putting them there. I am wondering though if the stores might get suspicious if I look like I am sneaking around, lol. I may do some at the library too, that is a good place to hide things without being seen. Now I need to make up more pillows and stuff them, I have one more bag of balsam so I should be able to make enough to brighten up a few people's day. 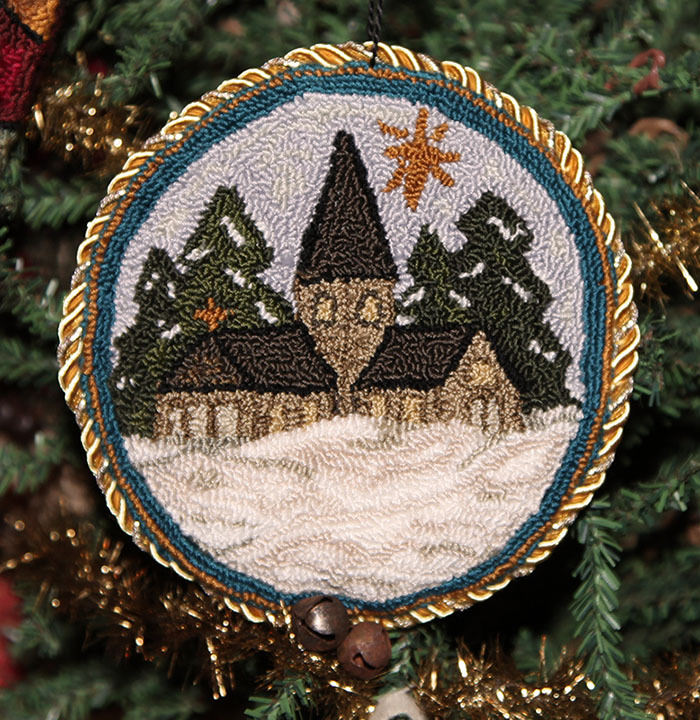 I also bought cording to add to the church ornament, I wanted it to stand out but working with thicker cord is not easy and it was falling apart as I worked it around the piece. I added some bells to the bottom which also distracts from my the cord ends. 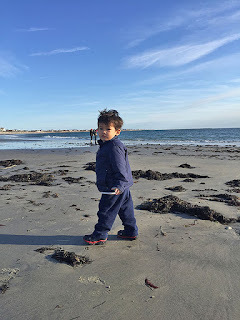 Saturday was the perfect day to do some Christmas shopping and then hit the beach. We picked up a lunch for Nick and enjoyed a picnic at the beach. He is making faces at Grandma. After lunch we drove down the road to the park so we could walk along the rocks. Grandpa and Nick enjoyed watching the boats coming in and out of the bay. 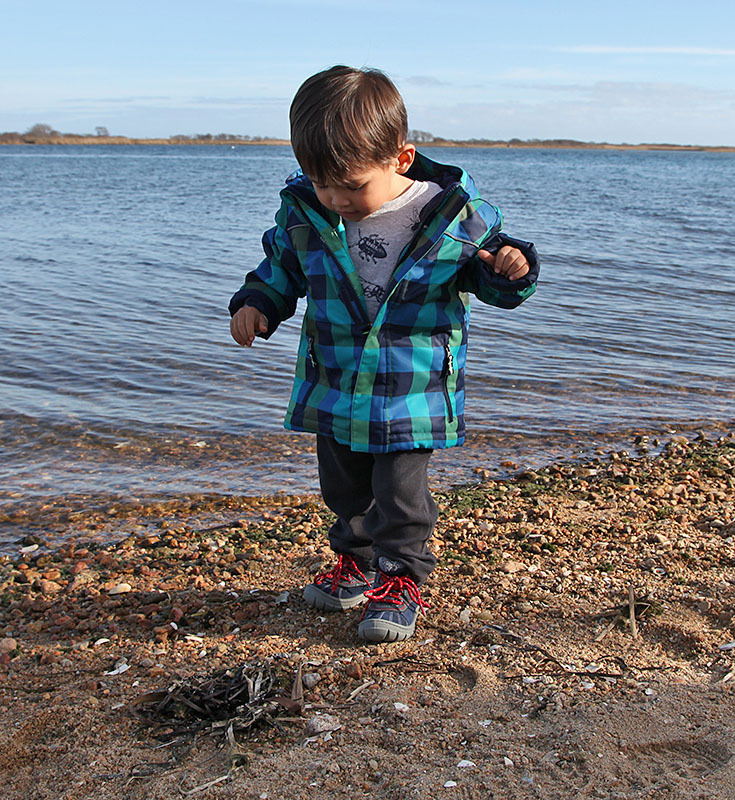 Nick spent most of the time picking up rocks and throwing them in the water. Nick loves rocks and with this area, he was in rock heaven. This is his reaction when a seagull flew overhead. For those who leave comments, I love to hear from all of you, but I do not reply on blogger, I reply personally by email. My comments come to my mailbox so if you are a no reply commenter, I cannot reply and you all have left me so many wonderful comments. 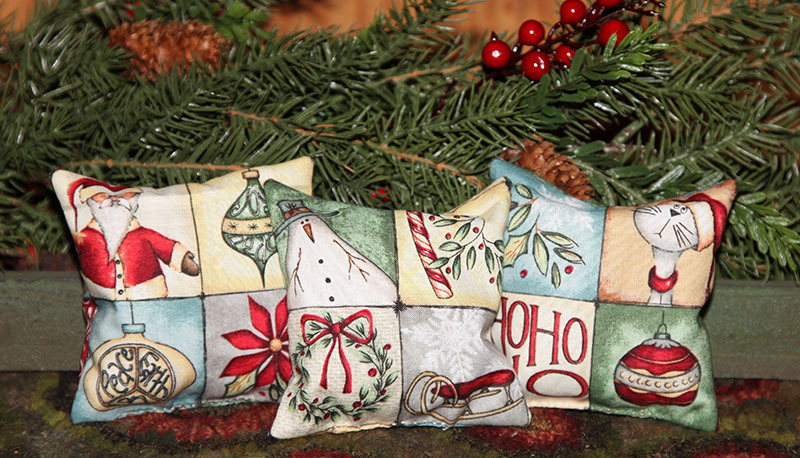 This week I have been busy finishing up some pillows and I just had to punch something;) I still have balsam and I was thinking of making some little stockings that I could fill with balsam and hang, so my house smells like fresh pine. 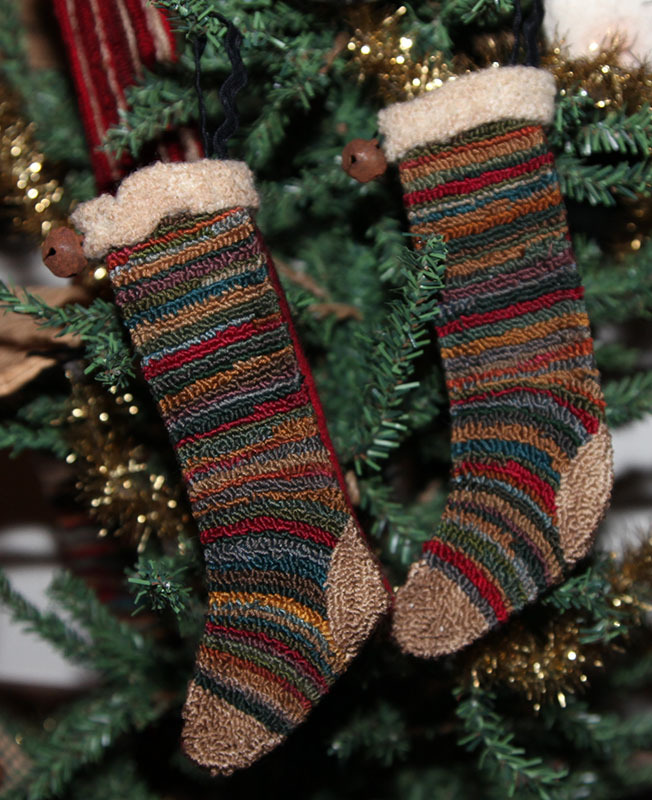 One thing I love about making stockings is it is a great way to use up the floss nest in the scrap box. I just grab pieces and use what I grab, so it gives it a nice scrappy look. I attached a piece of red wool to the back and then a loose weave wool for the cuff. 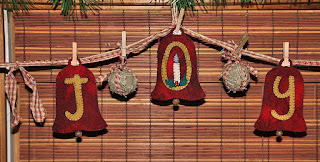 A little bell and a hanger and you have a fun ornament that can be made with what you have. The stockings are 6" long and I used walnut stain on them to grunge them up. 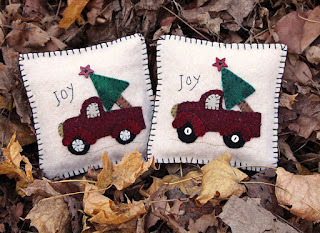 I love making these and I think it would be fun to make some all year round, to give as gifts for next year. Looking for something free and something you can color, use for stitcheries or pattern ideas? Check out this ebpage for a Free 98 Page Coloring Book. There are lots of beautiful designs by artists that have shared their artwork for the coloring book. I hope everyone has a wonderful weekend. We have a nice day for tomorrow and I am hoping we can do one of our drives and see what new places we can find. Of course I broke my, not making any more new things rule. 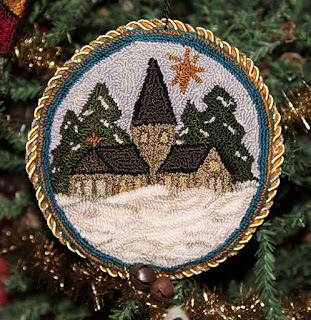 I just felt like trying a new punch needle and wanted to try a church. I found the design on a coloring site, and I changed the windows to look more like our church. It is not exactly like I wanted, but it didn't come out too badly and hopefully the recipient will like it. 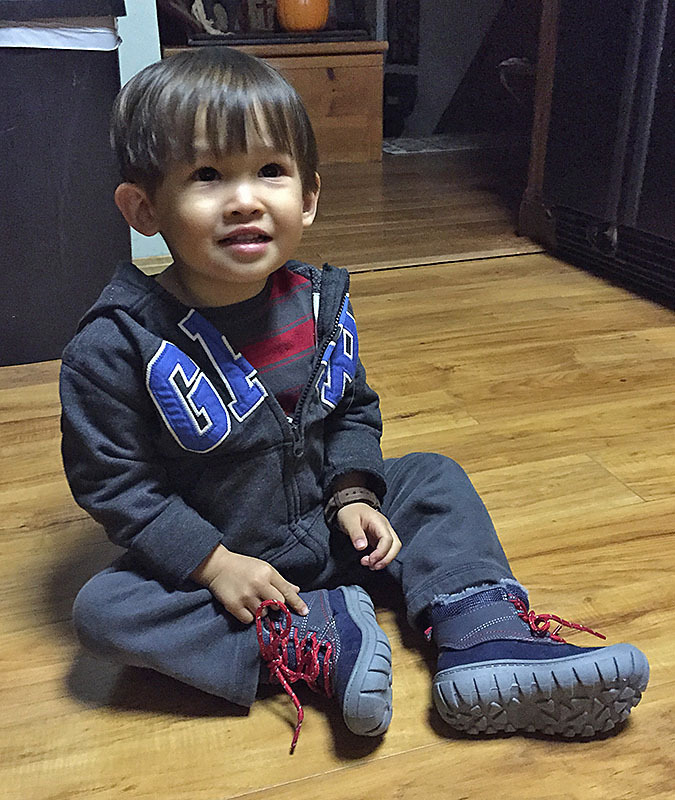 I had Nicholas on Saturday and we went to the school to play. I learned, take Nick or take Bean, but do not take both at the same time, lol. Bean was all excited and wanted to run and Nick was all over the place, so hard to keep track of two kids;) He got to swing and go down the slide and then we walked around the school yard. He was quite impressed when we encountered a bear. Another project I am doing this week is, making card ornaments with photos of Danielle, family and friends and I also told her friends that they can also make an ornament or buy one, and write something on it. 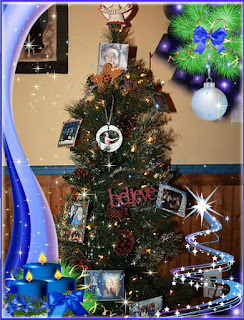 I am putting up a small tree in the beach room for her, it will be filled with memories and messages. I found a wonderful website that has beautiful cards that you can insert photos into. I also like that you can move the photo and edit it, so great for photos that don't quite fit. Here is a photo I used of Danielle at her friend Maya's wedding, this frame was perfect for the theme and Christmas and it helped to fade out the white flash that was on the top or the photo. I will print them out on card stock, so her friends can write on the back when they visit. I hope everyone had a nice weekend and are remembering to enjoy the season with those you love. You can make your own photo cards by visiting Photo Fun Editor. Another idea for those of you who have parents in Nursing homes. Make up some photo cards that they can hang as a banner, on a tree or tape to the walls. I hope you have been following the Twelve Days of Christmas, each day there is a new tutorial or free pattern that you can make, just in time for Christmas. Thank you to Wendy for hosting the hop and all of the ladies who are participating. You can follow along each day by clicking on the banner. I love to work with wool and I know most of you, love wool as well. 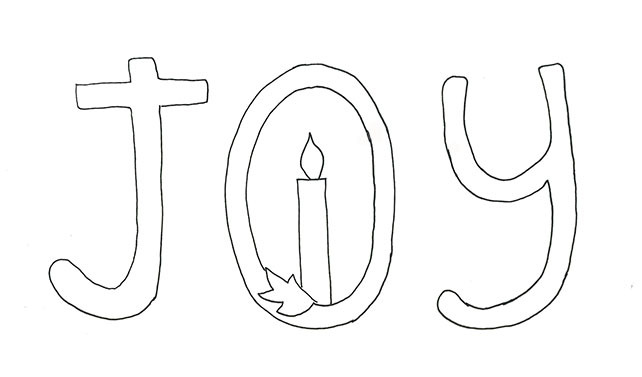 I also love doing pieces with inspirational words and I think Joy is one of my favorites. I hope you enjoy my project and make one for yourselves to remember to keep Joy in your hearts, each and every day, this season. I have given instructions, if anything seems confusing or you have a question, you can email me, anytime. 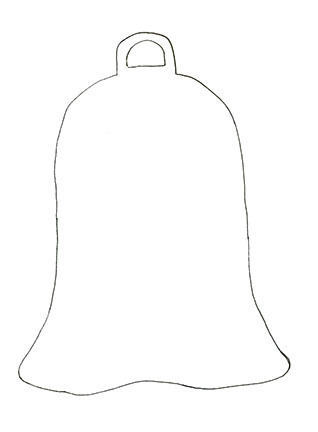 The bells are about 5" long, but you can make them any size by enlarging or reducing the design. This is closer photo of the bells, the garland goes across my windows, with more bells and ties. Have fun with the pattern, instructions are a guideline of how I made mine, but you can change it to suit your likes. 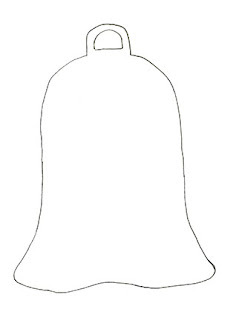 Cut out 3 bells, 3 bell backs, letters, candle, 2 leaves. 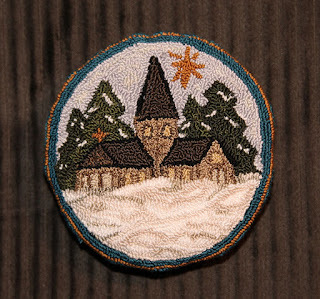 Sew on the appliques with a blanket stitch. Sew back and front with a blanket stitch, starting at the bottom and when you come around to the end, attach the bell with the same thread. Cut strips from the green homespun and wrap them around the styrofoam ball, until it is covered. Take a red piece and wrap it around the ball, twist around at the bottom and come around the opposite side, tie into a tight bow, leaving a few inches of the tail, to hang from the clothespin. You can buy pre-stained clothespins or soak them in walnut ink to age them. 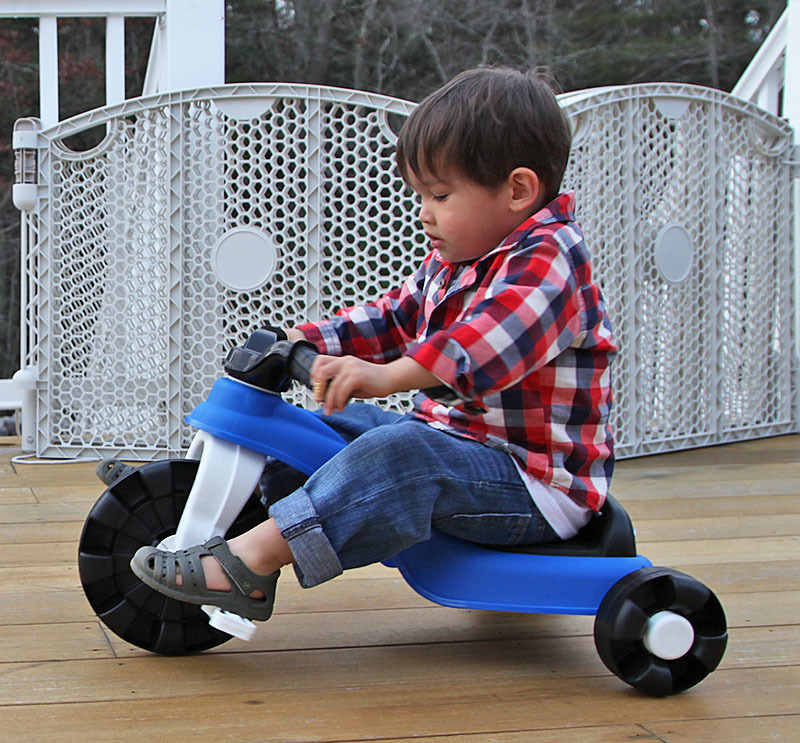 You can also have fun and paint them in christmas colors. 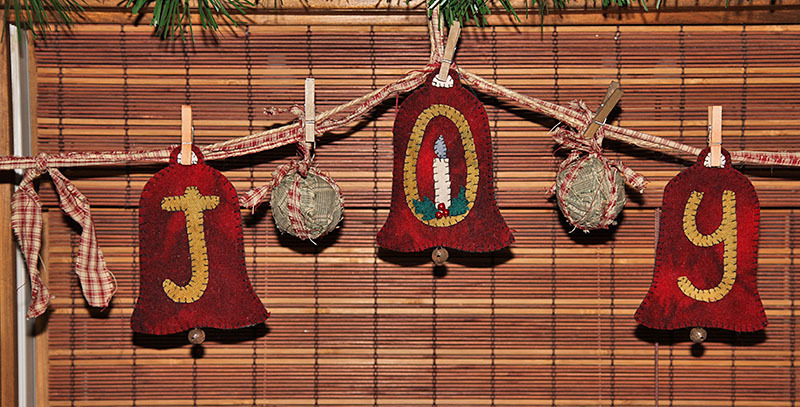 To make the garland, take a piece of homespun and a piece of jute and twist them together. Add red ties if you like to fill in the spaces, and you can add larger rusty bells, as well. 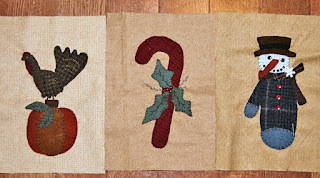 The length depends on how much you add to your garland and the size of your window, or area that you hang from. 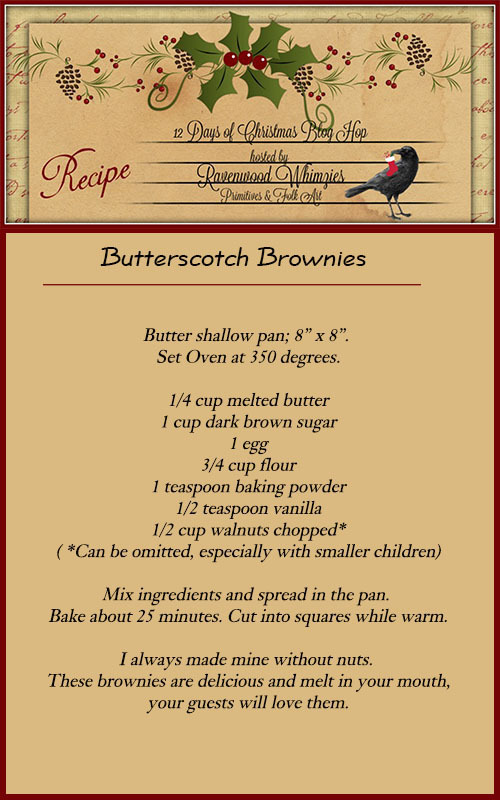 Another fun thing to do for Christmas is baking treats that everyone will love. I have made these for years, they are great for parties and your guests who come to visit. They melt in your mouth and I haven't met anyone who didn't love them. 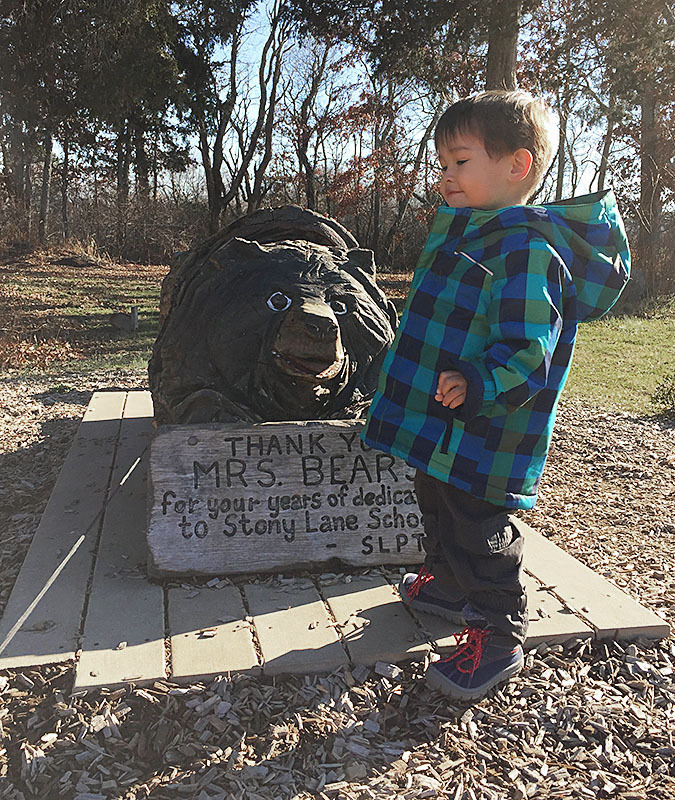 I hope you enjoyed visiting today and don't forget to follow along each day. 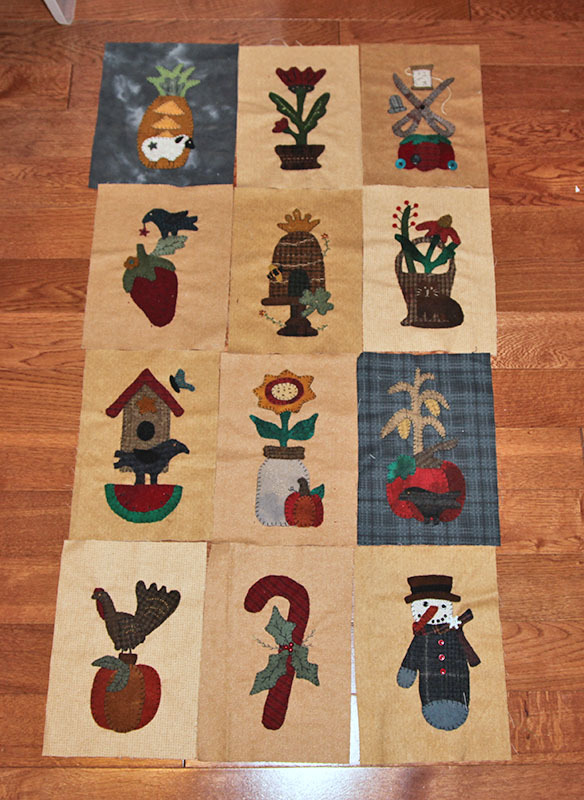 This weekend was busy, with Nick and the holidays, I didn't get much done in the sewing department. I had some designs cut out to make into pillows, but all I finished was the applique, so I need to finish more pillows and get them done this week. I am working on the instructions for the piece that I made for the Christmas Blog Hop, can you believe it starts tomorrow and my day is Friday. Be sure to visit and see what fun projects that the other girls are making. A design by Primitive Gatherings. 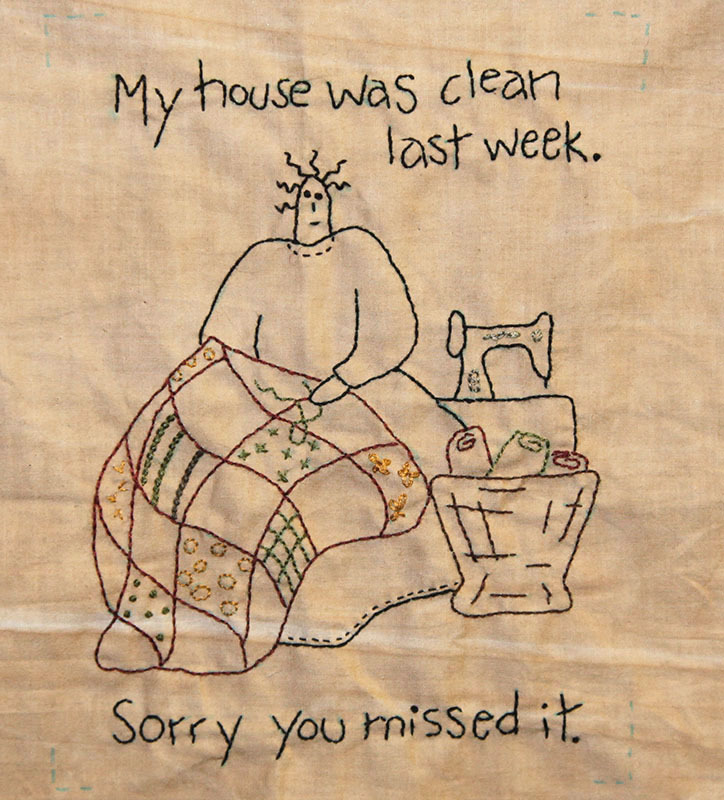 Of course I changed it and made it simpler, so the extra embroidery is not on mine. We had a day off from Nick sitting, he is not a good child to take shopping, lol. 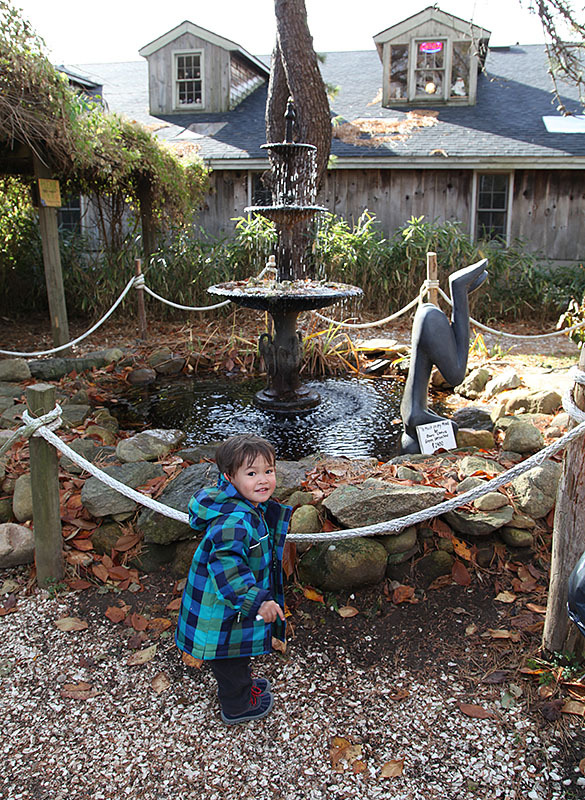 We went to A Bee's Buzz which is a big barn full of antiques and primitives. They have booths so you never know what you will find. 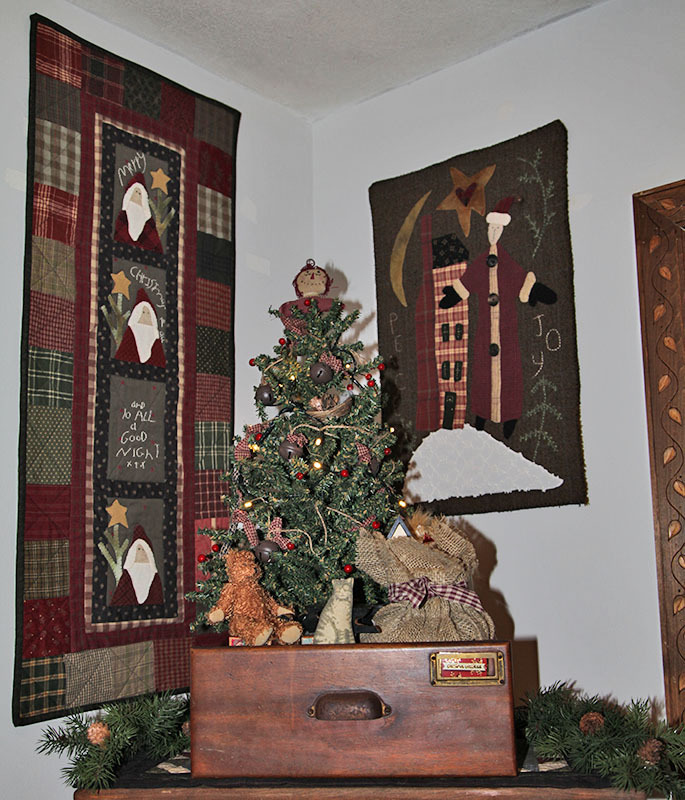 I usually don't splurge but I don't have that many nice Christmas primitives and I want to redo things this year so when I saw this display, I had to have it. 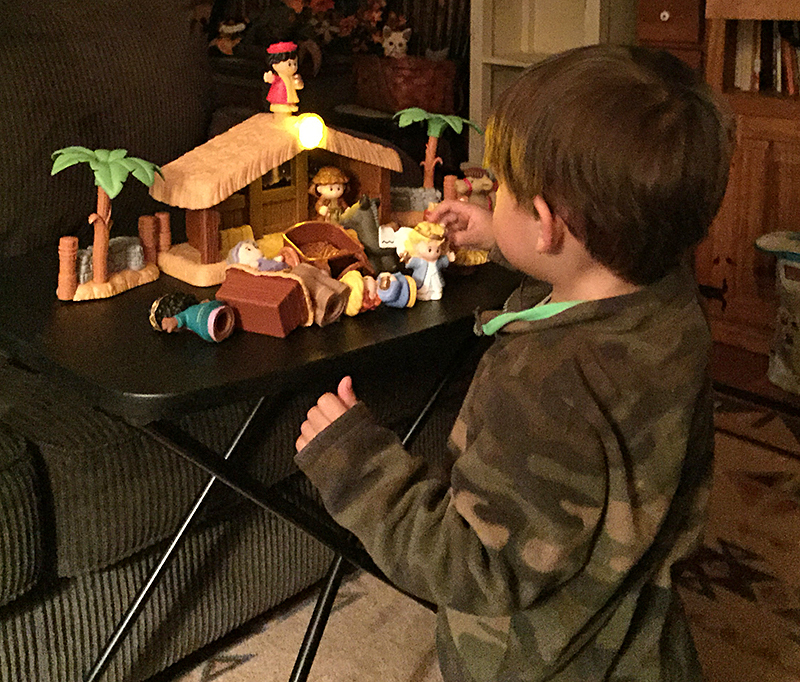 It is an antique drawer filled with toys around a decorated and lighted tree. I love the battery lights, I need to find some for my other small trees, so much easier than having to find a space with a plug. I also started decorating today. I made the wool piece and the longer piece was made by my friend Karen. I also loved this piece, something different and nice to have something to decorate the kitchen with. My find of the day was this magazine rack. It is handmade and it was marked down to 15.00. It is a little warped at the bottom, but not that noticeable. I will use it in my sewing room, I can keep the books and patterns I am using or want to make, in it and save space by hanging it on the wall. I hope everyone had a nice weekend. I have been decorating today, a bit bittersweet but I am determined to keep the magic and joy of Christmas in our home, it was Danielle's favorite holiday. I hope everyone had a wonderful Thanksgiving. We kept dinner simple and just enjoyed the day, food and family, no expectations or stress. Today we had Nicholas, so we decided to take him to The Fantastic Umbrella Factory. 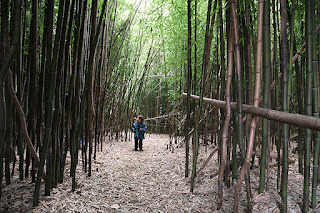 It is a group of stores and artisans in a farm like setting. It is a bit like a throw back to the 70's and in the warmer months they have folk musicians playing in the gardens. Today was beautiful, perfect for walking and browsing the stores and no crowds. They have pathways and a fountain that we stopped to get a photo of Nick. I was unaware of the surroundings, and just took a photo, then noticed what I had missed. Can you see what put that goofy grin on Nick's face? We went to the animals first, they have ostriches and a goat, as well as chickens and various birds, running around the grounds. 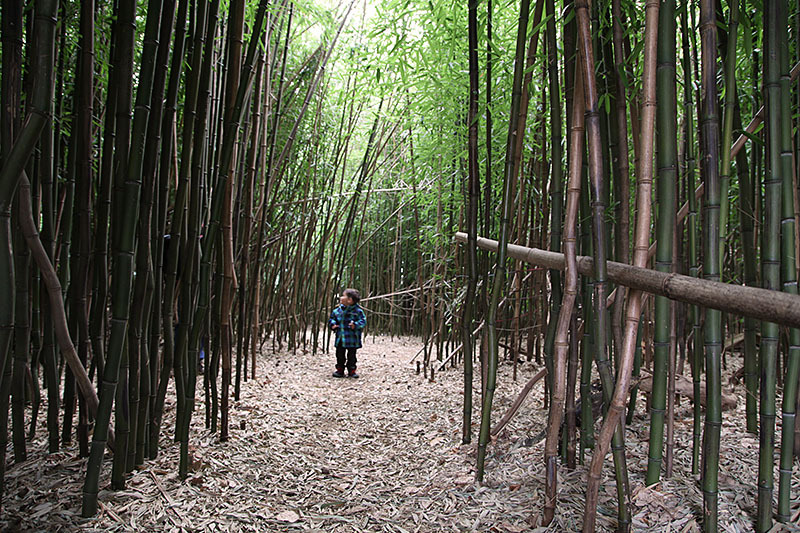 We took him to the bamboo forest, he was a bit apprehensive and then amazed at all the bamboo and how high it went up. 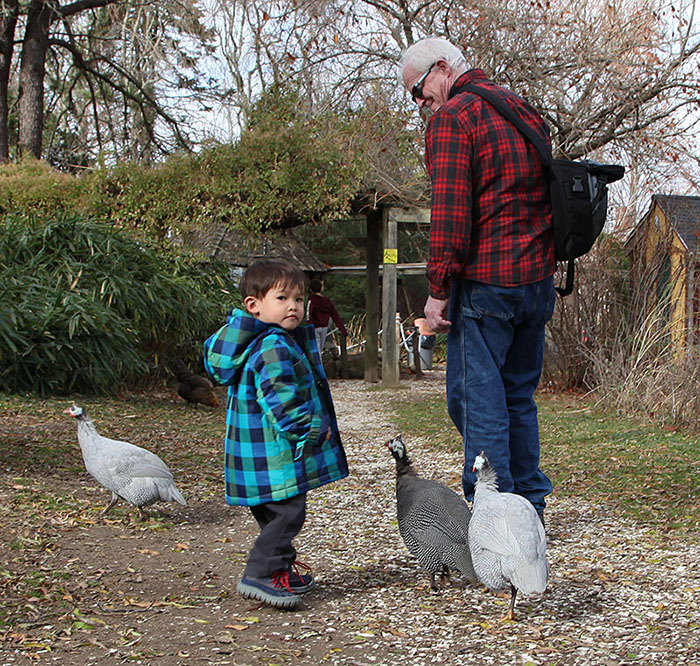 While we walked, we picked up a few buddies who followed us around. We also shopped small and bought Nick a wool hat and some gloves. 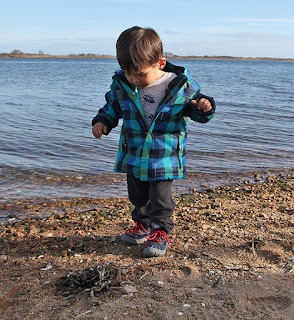 After that we went to Ninigret park and walked Nick in the stroller and then let him out to play on the beach. 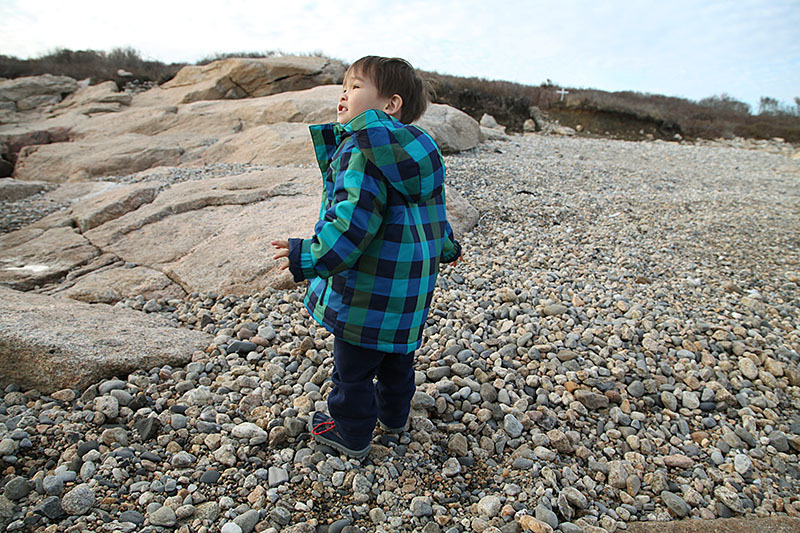 Throwing rocks is still his favorite sport. 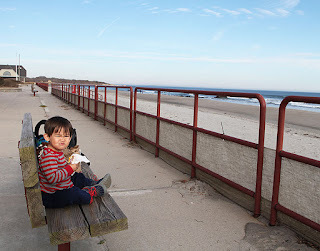 Nick needed to eat and there weren't any kid friendly places in the area, so we got him a fresh sandwich and enjoyed eating at Charlestown Beach. The perfect way to end the day and just enjoy the beautiful day. Four more days and the Christmas Hop begins. My day will be friday. I hope everyone enjoys the rest of the weekend. I wanted to make more pillows and something a bit quicker, so I made printable fabric pillows. I found some free graphics on the internet and printed them out with the printer fabric. I use the June Tailor, washable and colorfast. I heat set them, then rinse in cool water and heat set them again. Not really sure if they are waterproof or washable and I do notice they tend to run with the red ink. After I rinse them, I blot them with a paper towel and that keeps the reds from running too much. I made the mistake of using a higher resolution on the small pillows, that is why they are smaller. I forgot to change the size to compensate for the resolution. 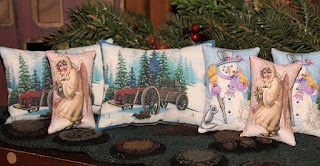 The wagon pillows are done at the lower resolution so they came out the right size. 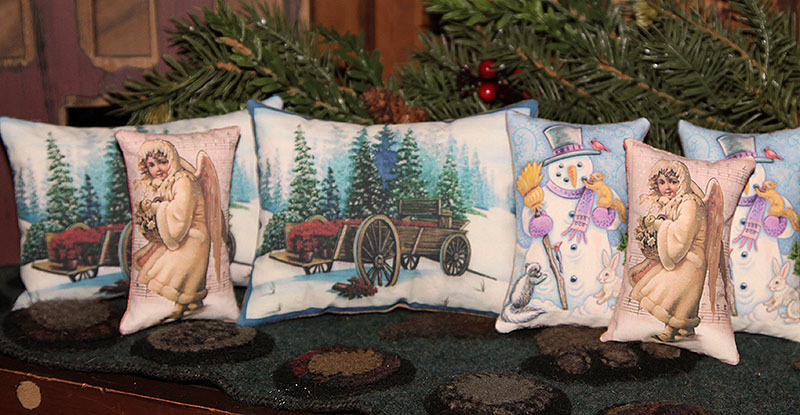 I like the smaller pillows too, they could also work as tree ornaments and if you don't have a real tree, the scent of pine would be nice on the tree. The thing I don't like is, the fabric is stiff so I had to cut an opening in the back to fill them, that is a pain in the neck. With balsam, it is easier to pour it into the bottom, then sew them closed. I also have to stitch them up and cover the ugly opening I made, so an extra step. 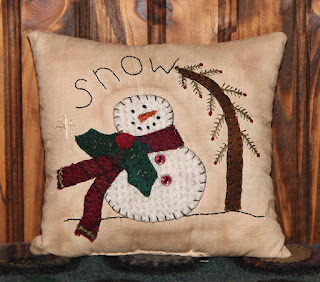 It is a nice way to make fun pillows though, and there are lots of free graphics on the internet. I had Nicholas this weekend so I gave him his new creche to play with. 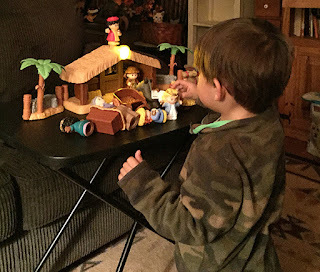 He loves to play with the figures and the start lights and plays Away in a manger, so we heard that a lot, throughout the day. Sunday he decide he did not want Mommy to leave, so it took me awhile to calm him down, but once he did, he was fine. 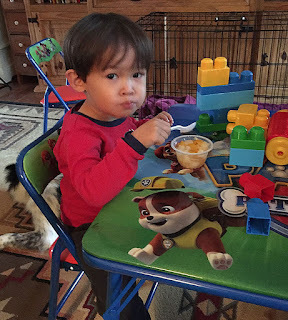 I decided he needed a table so he had a place to play and a place to eat. He loved the table and played on it all day and loved eating like a big boy. I guess I will not be online till after Thanksgiving. 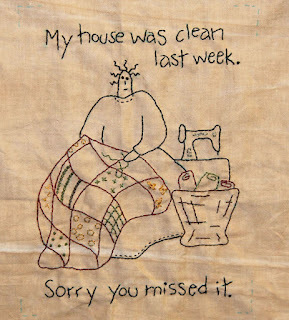 The kids are coming to our house, after all, so I will be busy cleaning and planning the meal, I have two more days, ugh. I always work better under pressure;) I hope everyone has a wonderful Thanksgiving, filled with family and good food. 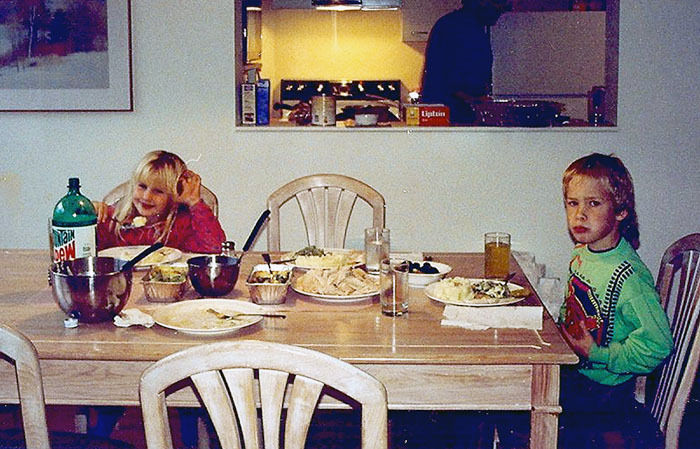 This is an old photo from a Thanksgiving at Waterville Valley in NH. They had santa come in on a dog sled and fireworks at night. 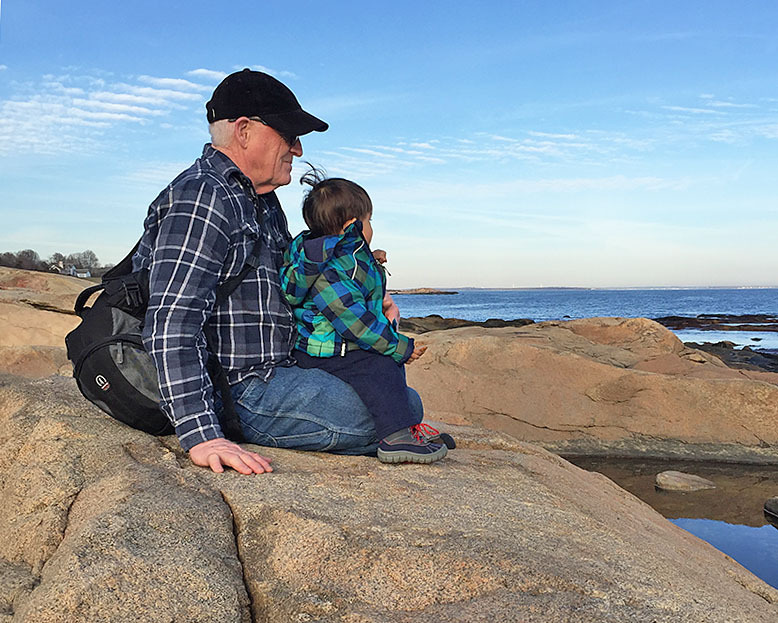 The holidays will be hard, but I will treasure the memories. I am still making pillows and it is fun to do new designs and with all of the blog hops this month, there were plenty to chose from. 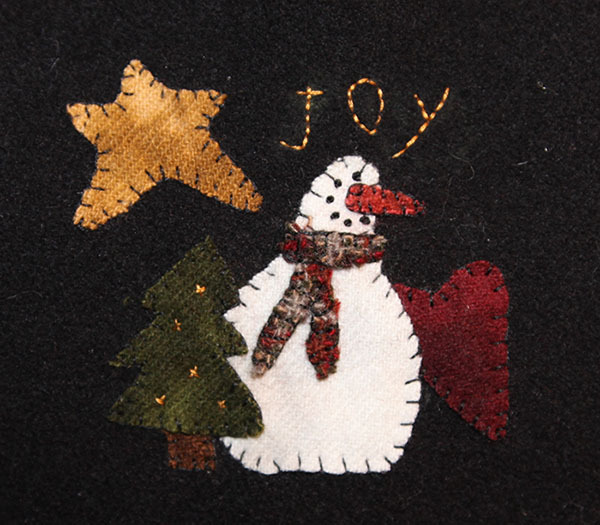 The snowman design is by Kathi, from Heart to Hand. Kathi didn't have a blog so you had to email her for the pattern and it is wonderful and fun to make. You can now download the pattern, on her website. I only did one snowflake on mine since I wanted to keep the pillow size down. I used stuffing and balsam in this one. Another design I have made before is the Christmas Angel by Pieces from my Heart. I reduced the design to fit on a little pillow. 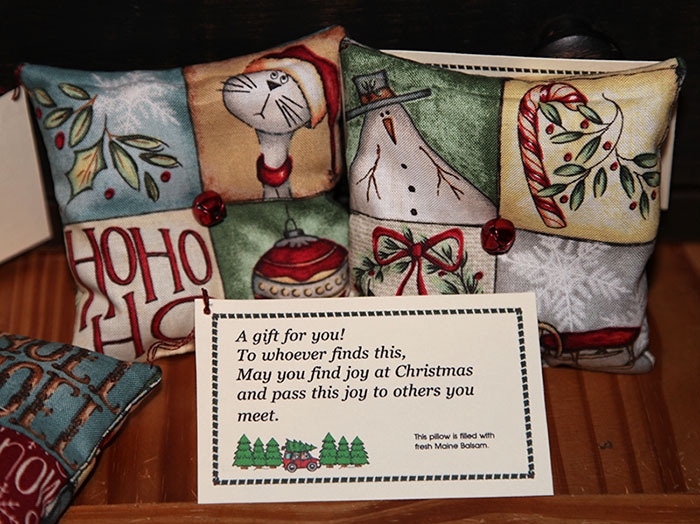 Balsam and stuffing in this pillow, as well. 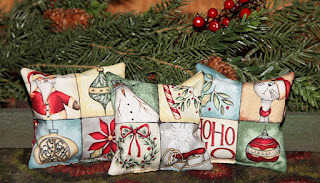 I am working on the Christmas Hop piece so that will be finished this weekend, but you have to wait until December to see the reveal;) If you are looking for some free designs to do your own stitchery pillows, I found a french site that offers a lot of Christmas designs, some I have never seen before. Check them out at Cathy Creatif's. I hope everyone has a wonderful weekend. I will be spending the day with Nicholas, so I am planning a fun party day with a special dinner and I even got him a present, a fisher price nativity set. He loves playing with my figurines so I thought this would be a fun gift for him and hopefully Bean won't try to eat it. I wanted something simple and fun to make over the weekend, love to stitch at night while I watch tv. 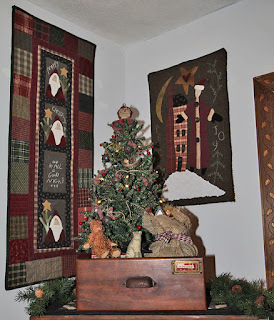 I have been following the Christmas Blog Hop hosted by Buttermilk Basin and if you haven't followed along, check out Stacy's blog and you can see what other patterns have been offered during the hop. 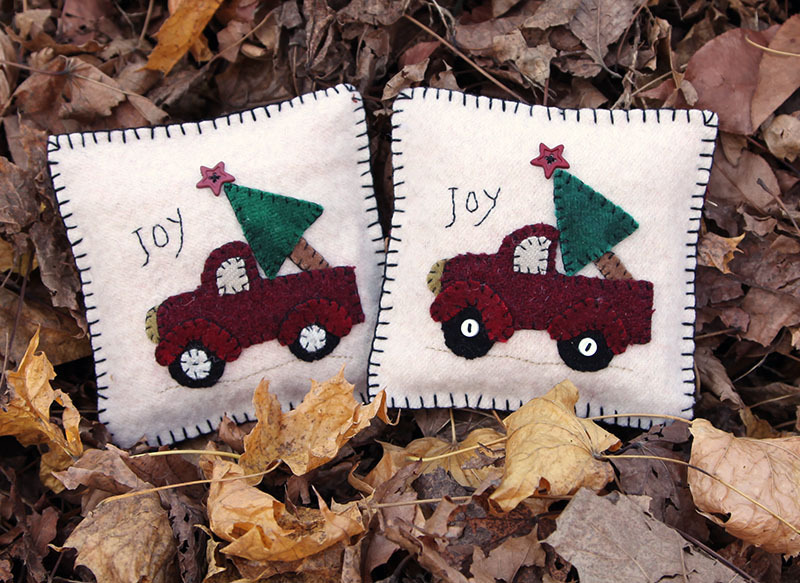 On day 3, Debbie of Wooden Spool Designs made a wonder christmas truck ornament. I decided to make mine into a pillow and stuff it with balsam. The design is perfect with the fresh cut tree, for a balsam scented gift and a nice gift for the guys too. I had a lot of fun making them and they worked up quickly. I decided to go with a fuzzy white wool, but I may try some with a night sky and a different colored truck. 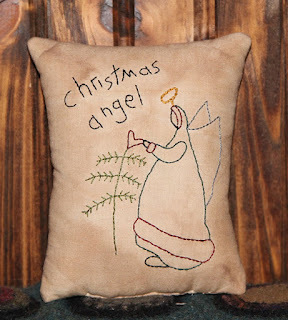 I added the word Joy to the pillow, and a button star. You can see in the photos, I did one hell with wool and one with buttons, fun to try different variations. Since I used a white background and wool, I decided to go with a blanket stitch, but I didn't want the balsam to fall through the edge. I took two pieces of batting and sewed them up to one edge, filled it with balsam and then sewed up the last edge, so it keeps the balsam sealed inside. I had Nicholas on Saturday. We went shopping, since I am still looking for the perfect booties for my skinny jeans. 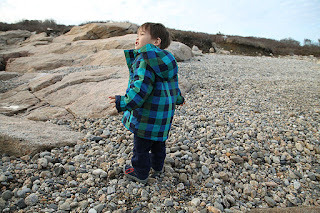 I want something rugged and waterproof and my style, so I am still looking. Of course I couldn't resist looking at kid's shoes and Nicholas is growing out of his sneakers, so he got a new pair of boots and he loved tromping around in his big boy shoes. 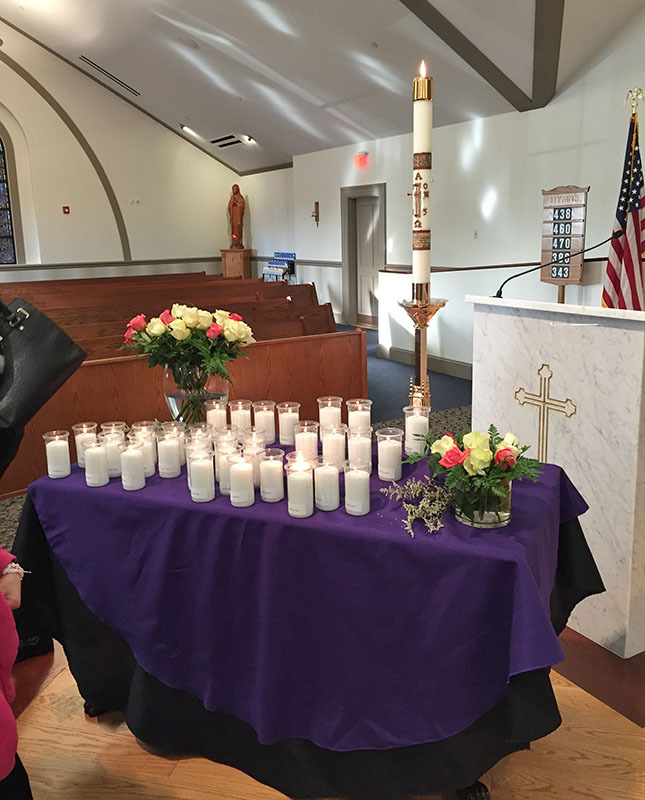 Sunday was a memorial mass for those who have passed this year, in our church. We each got a candle with their name and after the homily, they read the names of each person. When Danielle's name was read, we all walked up and handed the candle to Father David, to be lit, then put on the table. It was a truly moving service, and the choir sang with all their heart and love. Well, I would call it another un-finish, but I got the stitchery done, so all I need to do if make it into a mini quilt. 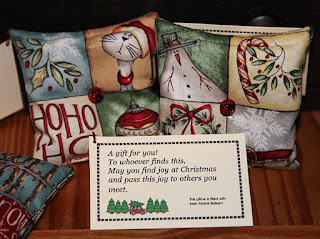 I thought it was a fun designs and a fun idea for gifting to quilting friends. I am not sure if the design is free, but the person offers the design on their site, so I assumed it was free? Now I am not so sure, since some have other designer's names on them, this has her name only. There is so much on flickr sites and I know a lot of it is scanned from books, so hard to tell what is free anymore. It seems the months are flying by and before we know it, it will be December and time for The 12 Days of Christmas Blog Hop. 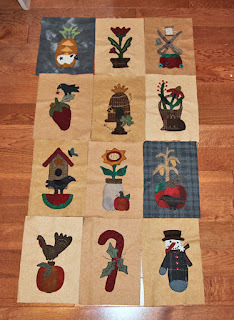 I will be doing a post on day 4 and today I have my pieces all cut out and ready to do this weekend. 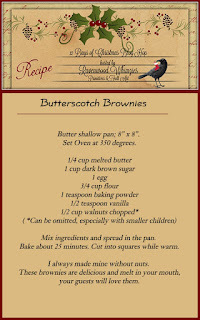 Don't forget to mark your calendars, patterns and recipes for the holidays! I hope everyone has a wonderful weekend. 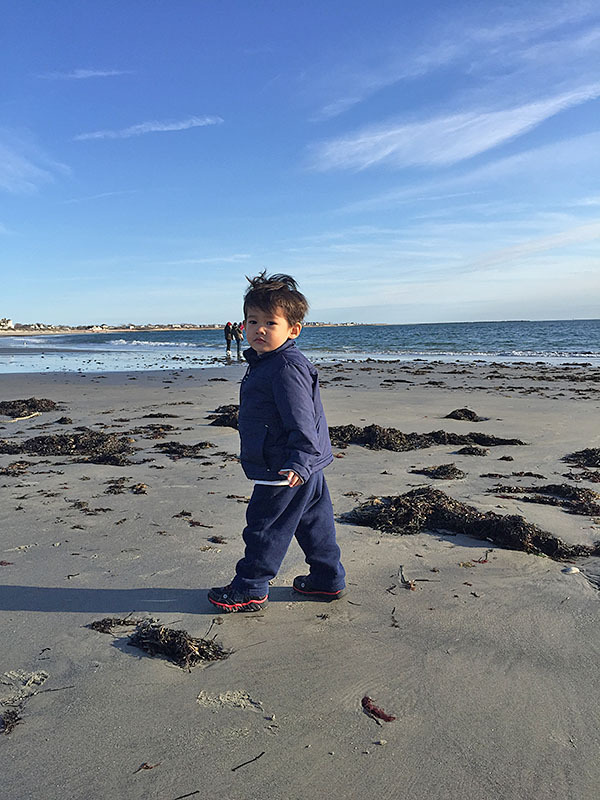 I will be stitching and keeping Nick occupied, and on Sunday there will be a special memorial mass at church and our son will do the honor of carrying his sister's candle, to be lit.